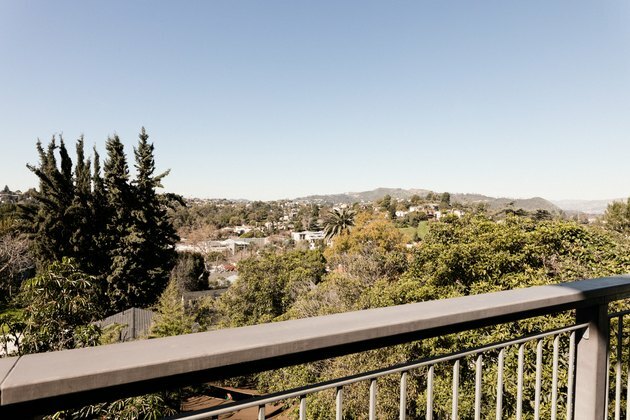 Native Angelenos Ilana and Mark Saul live in quite the remarkable enclave in Silver Lake, not just for its blissful hilly views of the city and the architectural gems on their street, but also for the fascinating people who have lived there — writer Anaïs Nin, actor Ryan Gosling, and Los Angeles Mayor Eric Garcetti, among others. So you could say that they reside in an area that is conducive to creativity. And they'd probably concur: Ilana, co-founder of digital media firm Polka Dot Media, applies a distinct touch to how she styles their home and all the projects she produces, while husband Mark, an actor (Grey's Anatomy, Mom, IAMA Theatre Company), often preps for roles, composes music, and produces book sculptures for his Novel Brand line at home. Indeed, in the eight years they have lived in the 1939 duplex, they've been quite productive — including having two kids. 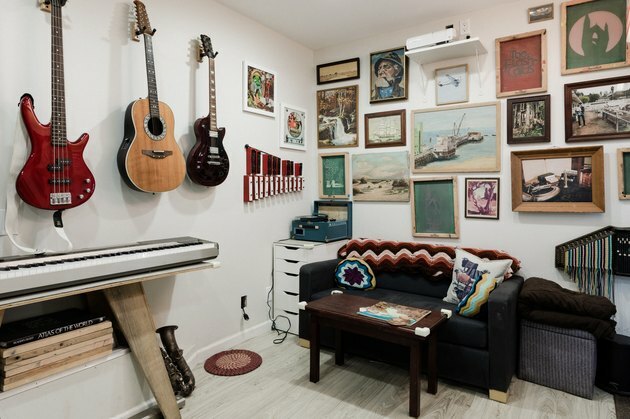 Decor that reflects their appreciation of handcrafted and vintage items, functional pieces with a timeless quality to them (many from friends' stores), as well as fun family finds and creations fill their two-bedroom bottom unit. 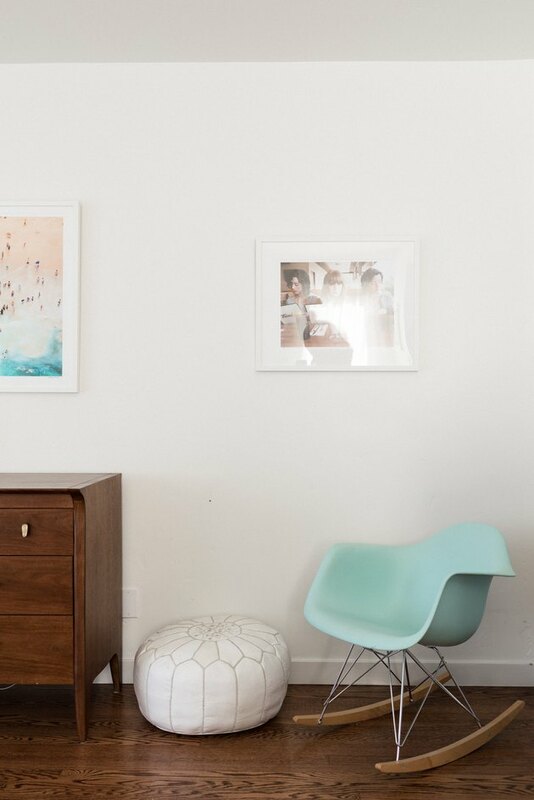 Perfect examples of this are the various handwoven baskets from a store owned by Ilana's client Lauren Conrad called Little Market, a nonprofit that develops fair-trade relationships with artisans around the world. "They make toy storage look chic," notes Ilana, "and I can have them on low shelves without having to worry about my toddler throwing them." 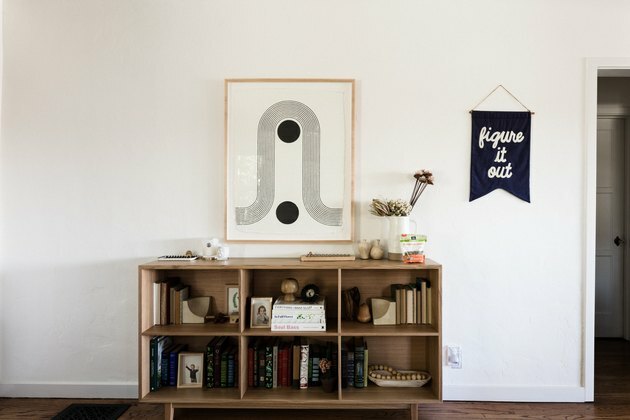 The bookcase by their front door was custom-made by Hedge House Furniture, above which hangs a Sunwave print by L.A.'s Block Shop, a textile studio that has a fair-trade partnership with Indian artisans. 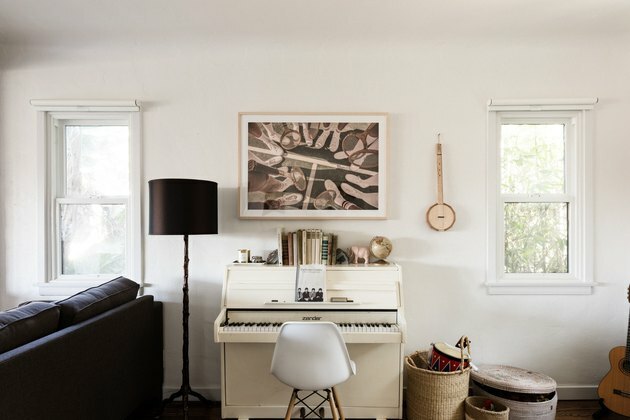 There's also the charming piano that a client of Mark's father didn't need anymore. (His father is a contractor and helped renovate the duplex.) Against the same wall, above the TV hangs a deer portrait by Mark's sister, Deanna, who gave the Goodwill find new life with some glitter, paint, and cotton stuffing. Deanna, a costume designer, lived in the unit before she switched with Mark and Ilana a few years ago as their family grew. 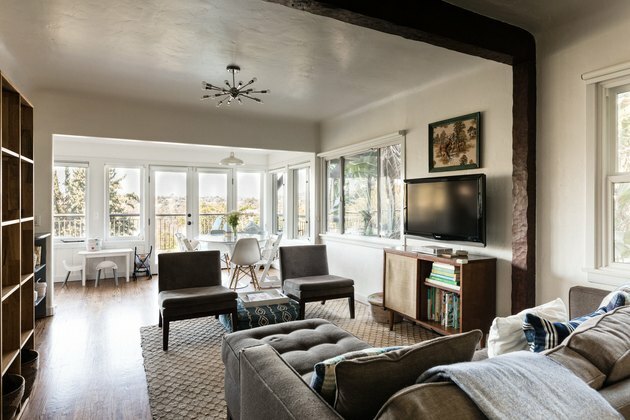 When they moved in, they gave the kitchen a fresh look by painting the brick wall white and adding new light fixtures and cabinet hardware from Portland's Schoolhouse Electric. 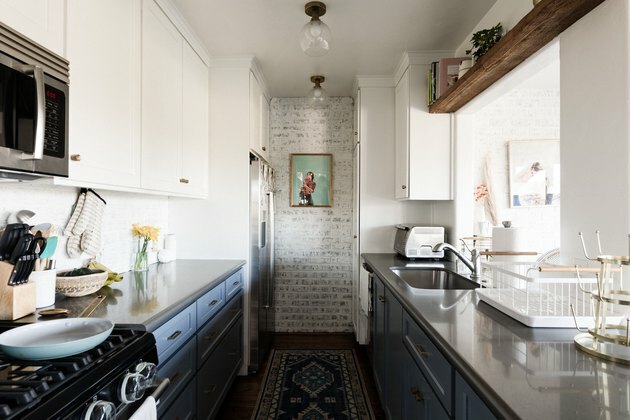 "I love the way we designed it — with all the white, the brass hardware, and gray-blue cabinets — but having a narrow galley kitchen can be really challenging," she explains. "It's really hard for us both do be in here cooking." 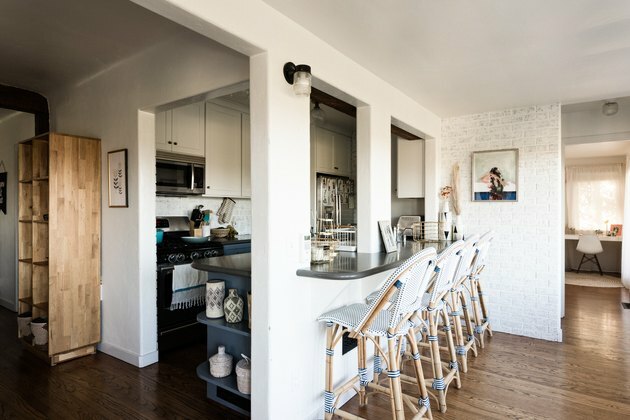 Though the bar area, with their Parisian bistro barstools from Serena & Lily, helps the kitchen feel less cramped and provides a nice seating area for the kids and friends to socialize with them while they are cooking. In the master bedroom are more touches of old, new, and meaningful: pennants from their wedding that Mark's mom sewed, pristine midcentury dressers from Highland Park's Sunbeam Vintage, a photograph of musician Jenny Lewis ("we're a huge fans," says Ilana), and the Watson Twins by Autumn de Wilde; overhead and bedside light fixtures are also from Schoolhouse Electric, and an aerial beach scene by Gray Malin, another Polka Dot Media client, whose colorful prints hang throughout the home. 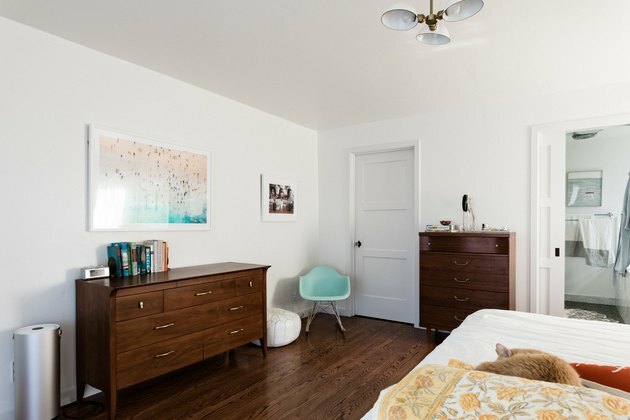 And where you'd generally find nightstands, the couple chose furniture that does double-duty: "We both work from home a fair amount so we both put in desks as nightstands," Ilana says, as recommended by design blogs she follows. "I actually think the desks make the bed look more complete — even though we totally did it because we don't have an office." 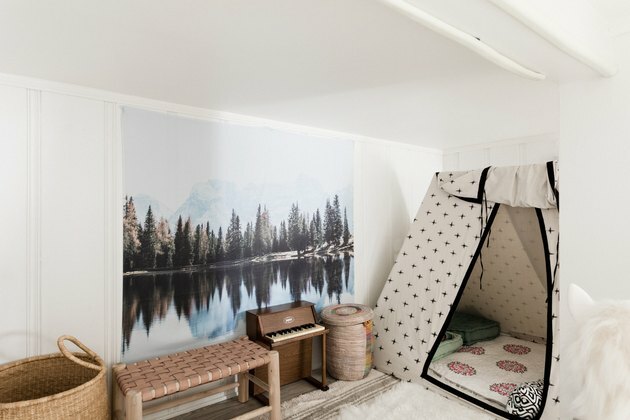 What they do have are two rooms many of us would covet: a secret playroom, accessible through the kids' closet, and a basement-level studio, which has its own entrance. 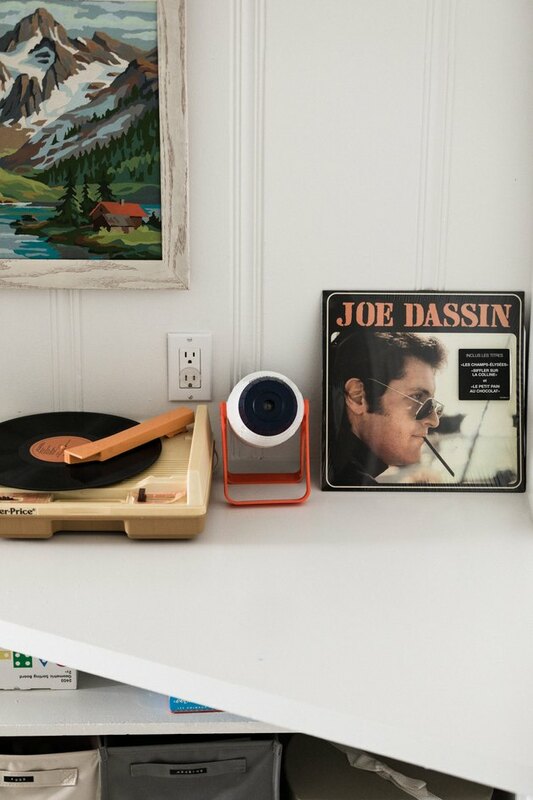 In the playroom, Ilana points out the kids' personalized book sculptures by Mark, a kid-friendly record player that is used often, and a large tapestry purchased from Society6. "It's nice to have a play area where the kids can keep a ton of toys," Ilana says. 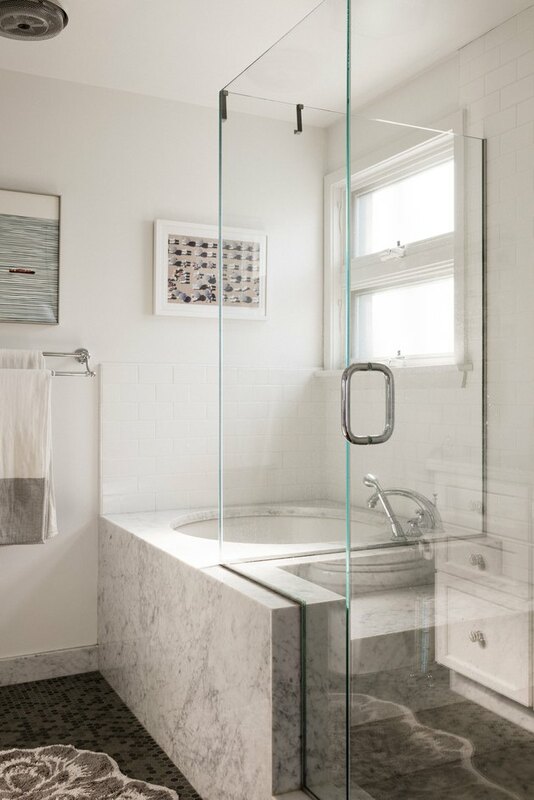 "They love it in here, and this space is the main reason we switched units." On the other side of the house is the windowless studio where, Mark notes, things they don't want anymore usually end up "before we get rid of it." 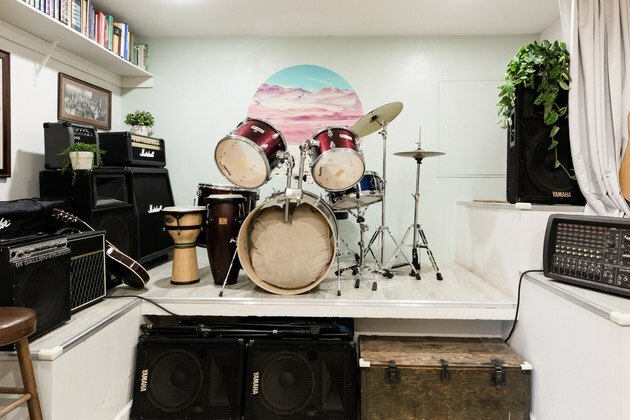 It's a wondrous space chock-full of musical instruments, recording equipment, old Reader's Digest books he uses for Novel Brand projects, and thrift-shop album purchases he uses for collages. "Something I like that Mark said the other day about it was, 'it's not the man cave, it's the fam cave,'" Ilana shares. "The kids love to come down here and play music with him. Nothing's off limits, it's not where Mark comes to escape." 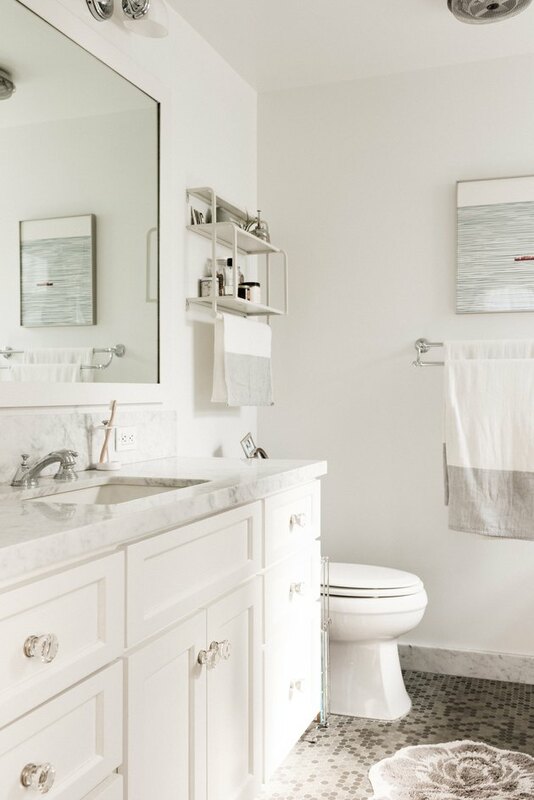 In the couple's airy bathroom hangs another Gray Malin print. 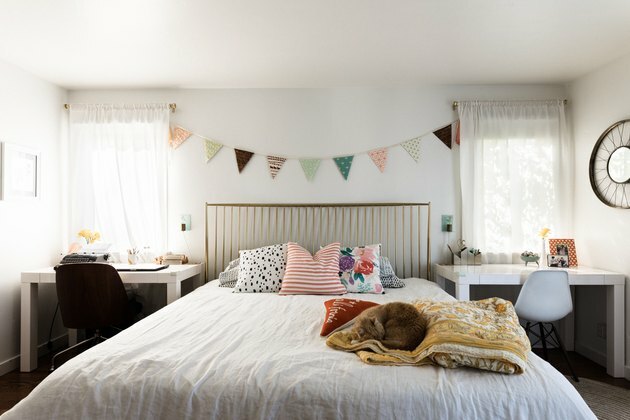 Though personal space can sometimes be an issue in their home, its size is also what they like about it: "I like that it's not a huge house because we're always cleaning," admits Mark. "I can't imagine what it's like to clean a huge house." Teena Apeles is a writer and book editor. 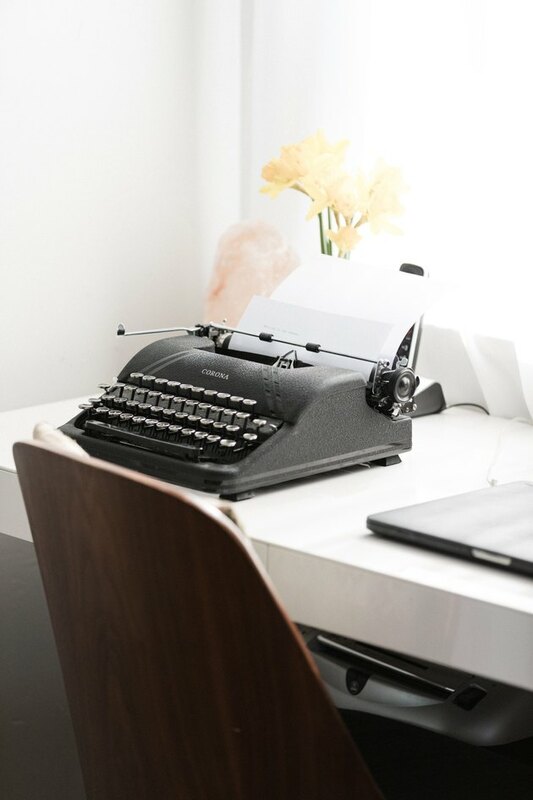 She founded the L.A.-based creative collective Narrated Objects, which recently released the anthology Dear Seller: Real Estate Love Letters from Los Angeles.